Librarian Ruth MacIntosh radiated humor, good-heartedness and dignity. Though I only knew her as a library patron, Ruth mattered to me a lot. Any encounter with her always lifted my day. Ruth had an assortment of playful outfits: full Red Sox and Patriots regalia, a necklace of black bats that came out in late October, and a Wild Things t-shirt that I coveted, with Sendak's creatures dancing across it. They went well with the twinkle in her eye, and contrasted nicely with the aura of unruffled integrity that she always carried herself with. I loved her lively, intelligent face and asked her several times over the years if she'd let me paint her portrait, or be willing to sit for photos. This request was met with a kind but absolutely emphatic no. While Ruth was in the hospital, the friend feeding her beloved cat was allergic, and needed to run in and out with just enough time to set down food. I'm known as a cat person, so I was drafted to soothe the extremely talkative, distressed animal. It took a lot of petting and listening, agreeing with every meow, "Yes, I wish she were here, too. No, I'm not her, it's true." but eventually it wound down to purring and even some drooling. 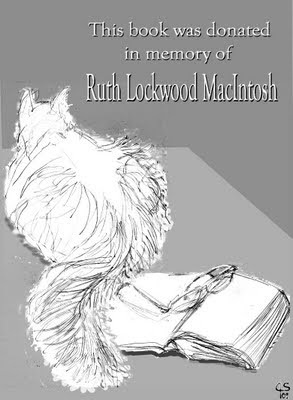 Early this summer I was so honored when members of the library staff asked me to design a bookplate for the collection of mysteries being purchased in Ruth's memory. It's being printed in black and white on labels with a fancy border, so I made the inside part. Here's a nice article about Ruth from her co-workers which includes a couple photos.